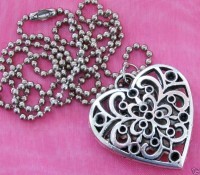 Antique silver tone abstarct heart pendant is 2-3/4 inches long. Comes with a 26 inch snake chain. Gorgeous! This silverplated Betsey Johnson baseball necklace is beautiful! 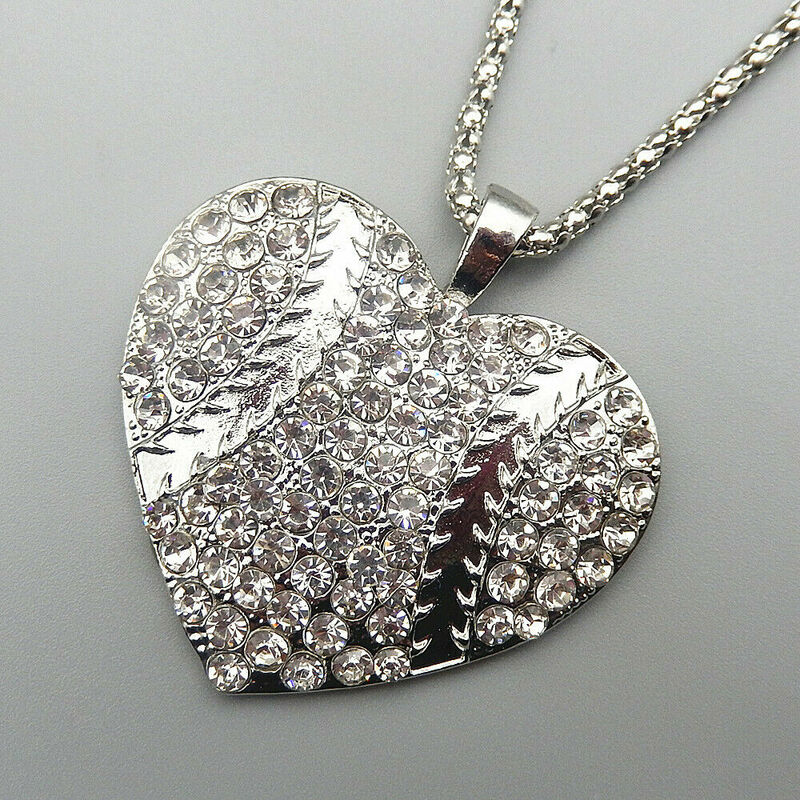 The heart pendant is 1-1/2 inches x 1-5/8 inches. The chain is 28 inches long. Perfect for the baseball or softball lover! Vintage style exaggerated triangle pendant made from alloy, resin and rhinestones on a leather braided cord. Leather Rope Pendant is 3-5/8's x 3-1/4 inches. A real statement piece! 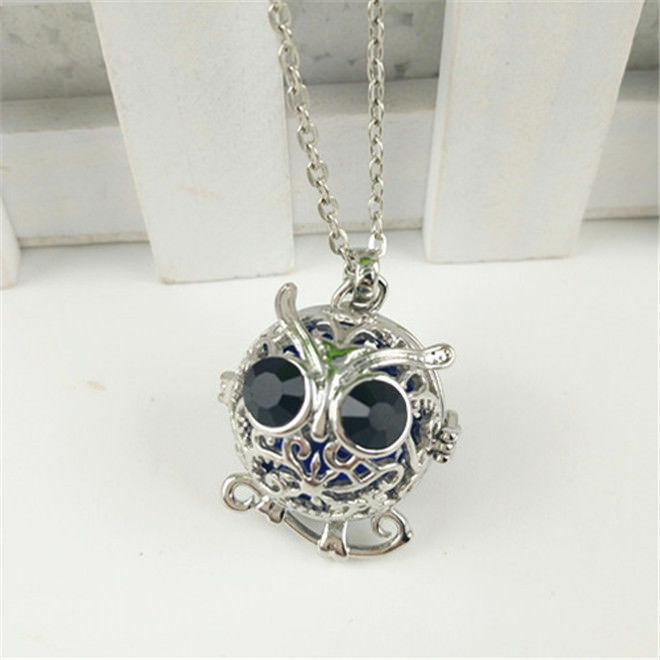 This puffy owl locket is 1 inch long and the chain is 18 inches long. It has 2 diffuser ball pads for the essential oils (Essential oils not included). Just put a drop or two on the pad and put in locket. The pad will last several hours. Then reuse by repeating instructions. Stylish and practical! This gold plated Betsey Johnson handbag pendant is made with a single black rhinestone and small clear ones. The chain is 27-1/2 inches long. The pendant is 2-1/8 inches tall x 2 inches wide. Perfect for someone in the purse or tote industry to advertise their business or for just fun! Vintage 1970's unsigned Lee Sands pendant is inlaid with black shell and white mother of pearl. 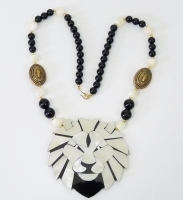 Necklace made with white quartz, black and mother of pearl beads measures 25" in length.Two antique gold large beads with one bead having only the front of it antique gold. Lion pendant measures 3" in length. Stunning! 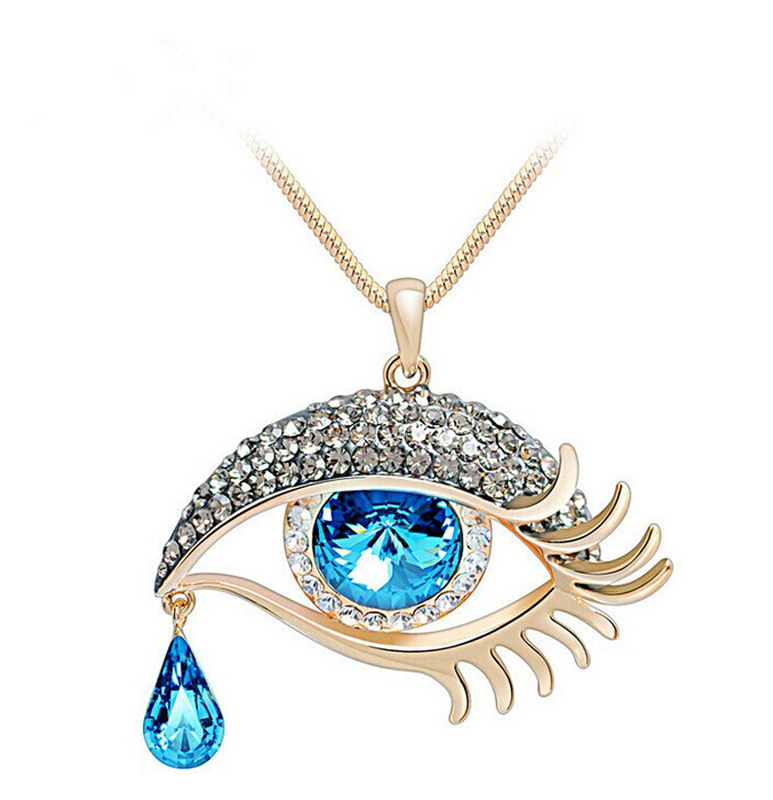 This gold plated Betsey Johnson eye pendant is made with blue and clear rhinestones. The chain is 27-1/2 inches long. The pendant is 2 inches x 1-5/8 inches. Perfect for someone in the beauty industry to advertise their business or for just fun! 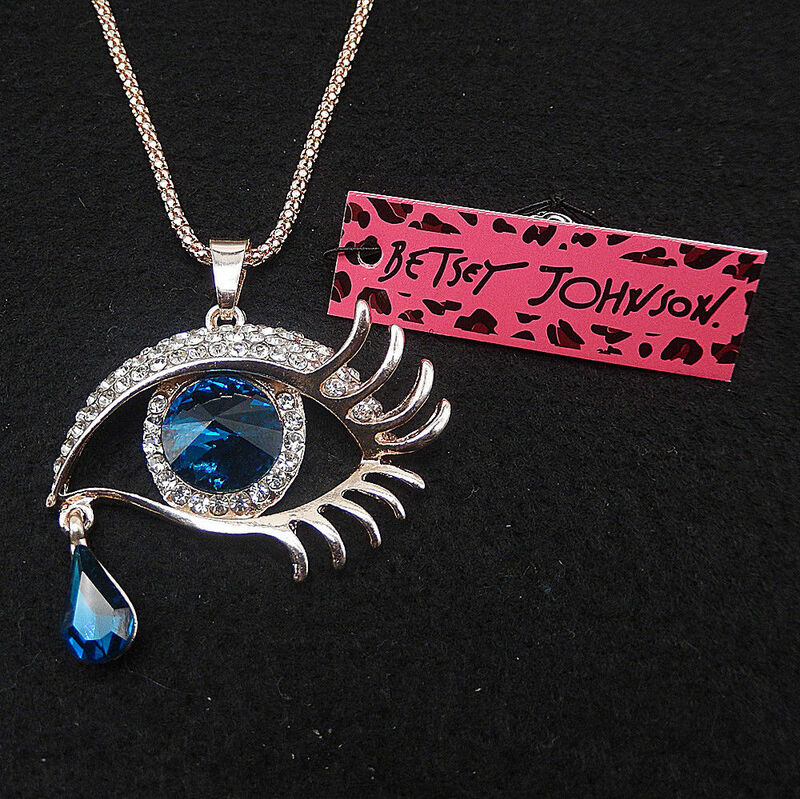 This silver plated Betsey Johnson eye pendant is made with blue and clear rhinestones. The chain is 27-1/2 inches long. The pendant is 2 inches x 1-5/8 inches. Perfect for someone in the beauty industry to advertise their business or for just fun! 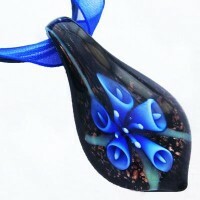 Gorgeous hand blown murano glass black pendant with blue flower inside. Comes with 18 " black lribbon/cord necklace with 2 " silver extender. 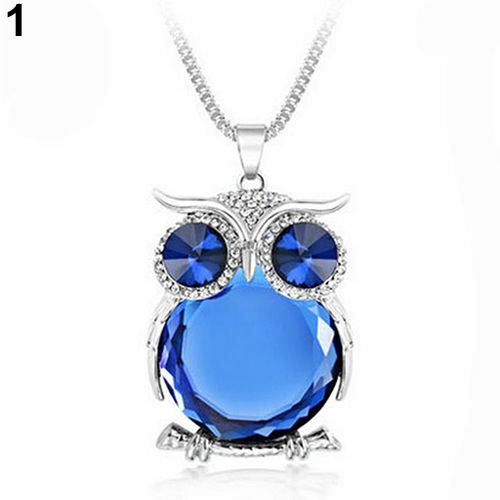 This blue glass owl is also made with clear rhinestones. The chain is 28 inches long. 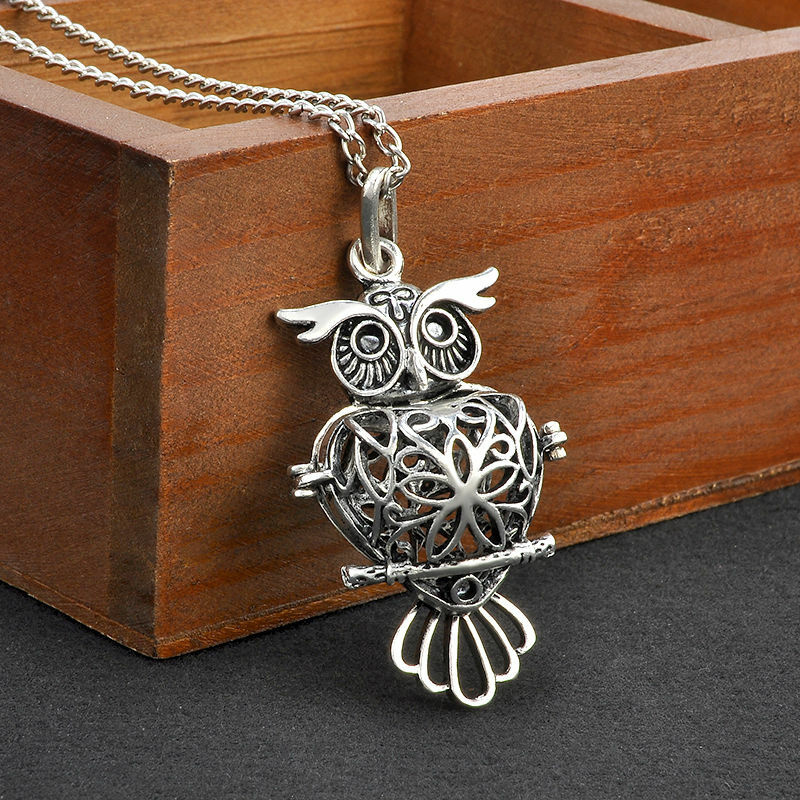 The owl pendant is 2 -1/4 inches long x 1-1/2 inches wide. Perfect for an owl lover! 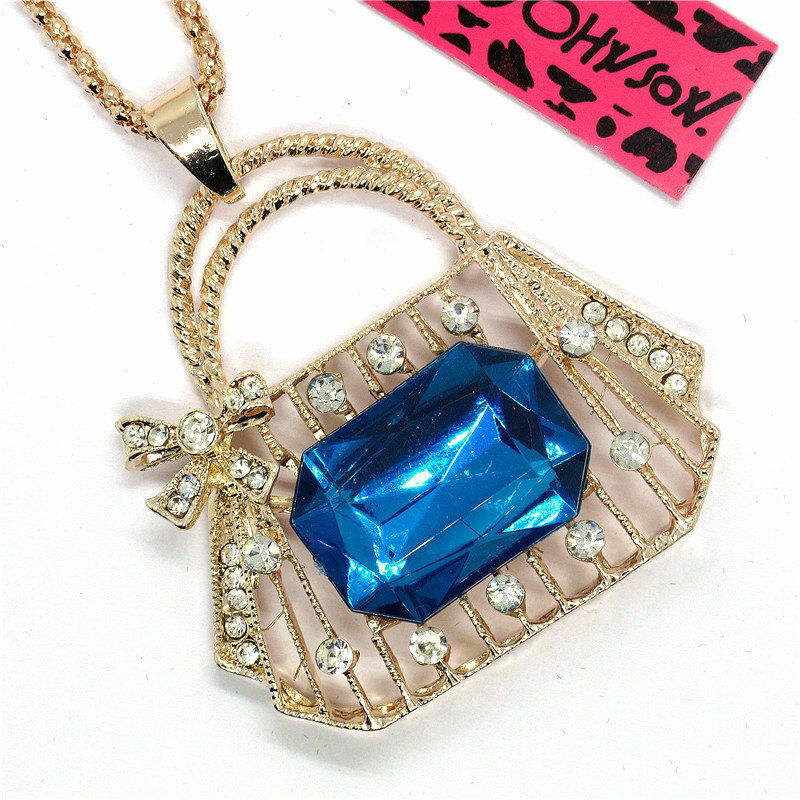 This gold plated Betsey Johnson handbag pendant is made with a single blue rhinestone and small clear ones. The chain is 27-1/2 inches long. The pendant is 2-1/8 inches tall x 2 inches wide. Perfect for someone in the purse or tote industry to advertise their business or for just fun! 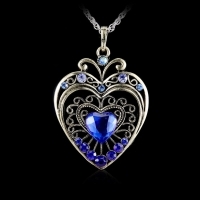 This retro style blue heart pendant has an antique gold finish and is 3 in x 2 in. It comes with a snake chain that is 26 inches long. Very elegant! turquoise blue Peruvian Murano glass and alpaca silver necklace. 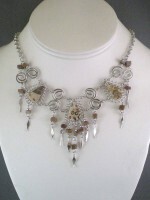 It is made with alpaca silver, which is an alloy of zinc, copper, iron and nickel, glass and cascajo stones. It is extremely lightweight and will not rust or tarnish. The necklace was handmade in Peru. Gorgeous blue swirl hand blown glass pendant made from boro glass. Pendant is 2-1/2 " long x 1" wide. Comes with 18 " black ribbon/cord necklace with silver adjustable 2 " extender. Big, bold, jewel-toned glass baubles with acrylic pearls--plus a hint of sparkle. 36 inches long + 4 inch goldrone extender. 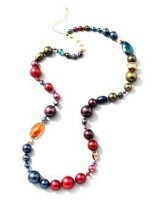 Colorful pearls match almost any color. Stunning! 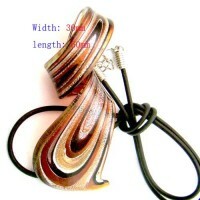 Gorgeous brown swirl hand blown glass pendant made from boro glass. Pendant is 2-1/2 " long x 1" wide. Comes with 18 " black ribbon/cord necklace with silver adjustable 2 " extender. 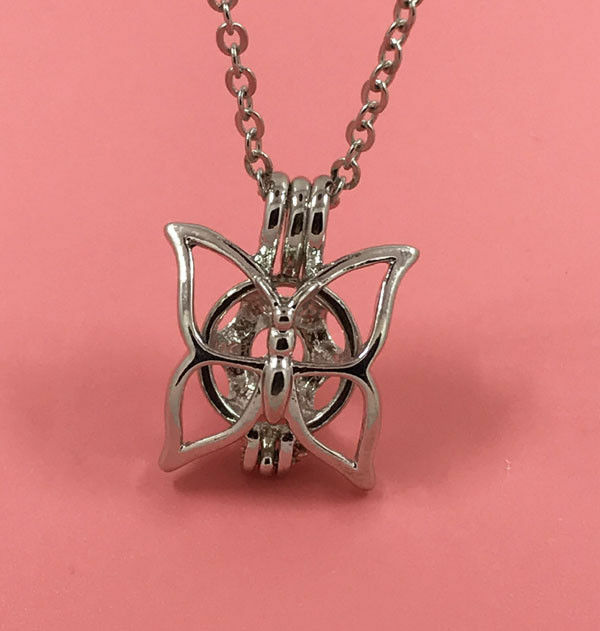 This butterly locket is 1 inch wide and the chain is 21 inches long. It has 3 diffuser ball pads for the essential oils (Essential oils not included). Just put a drop or two on the pad and put in locket. The pad will last several hours. Then reuse by repeating instructions. Elegant! 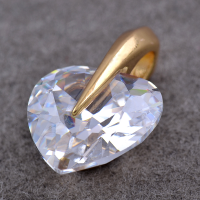 Vogue 14k gold filled clear crystal heart pendant is 3/4 inches long--very dainty. Comes with 20 inch gold plated chain. 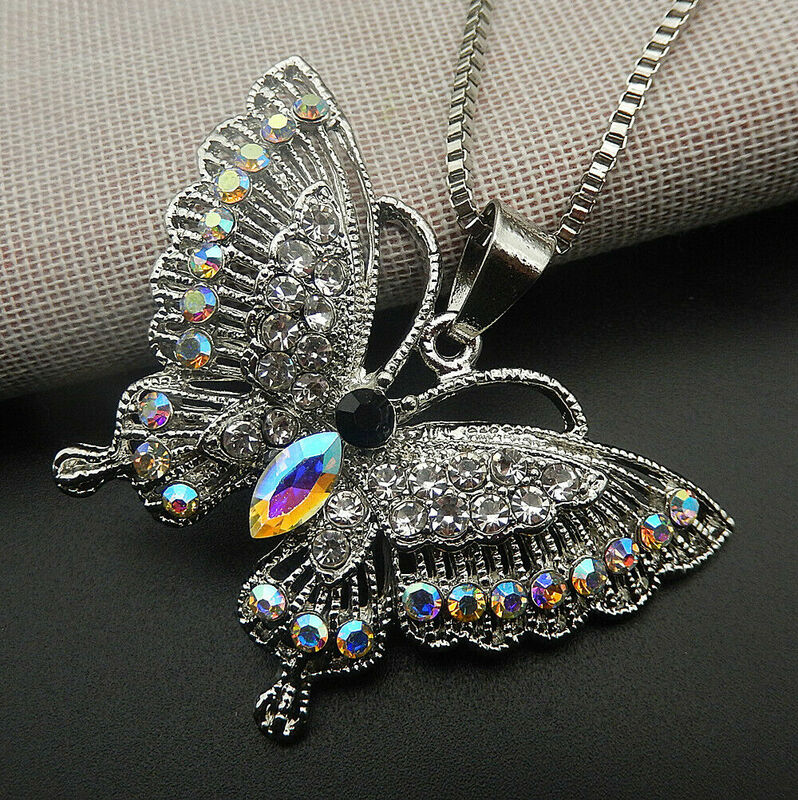 This gorgeous Betsey Johnson butterfly pendant is made with clear and ab rhinestones. The pendant is 1-1/2 inches x 2 inches. The chain is 28 inches long! Very versatile! 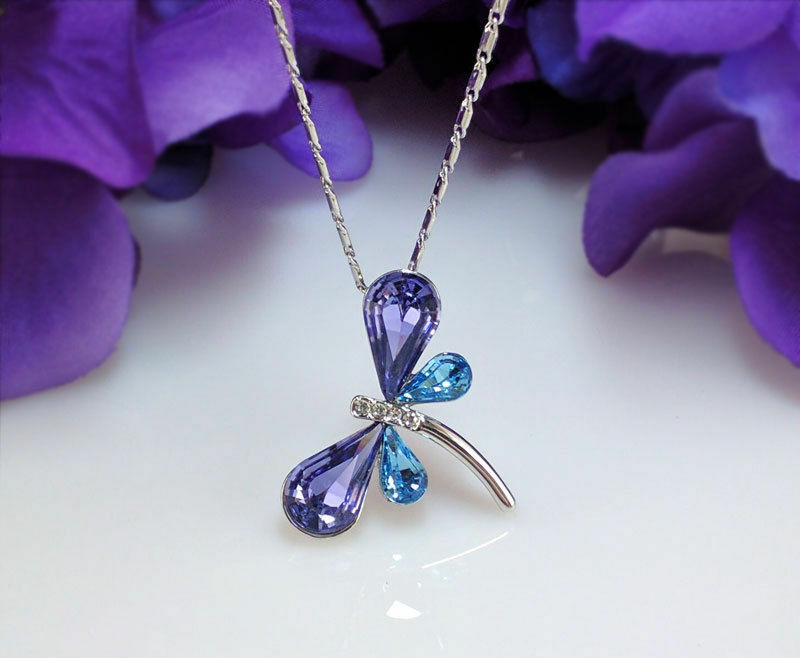 Clear rhinestones make up this silver dragonfly necklace. The pendant is 1 inch long. The chain is 20 inches long. Beautiful! 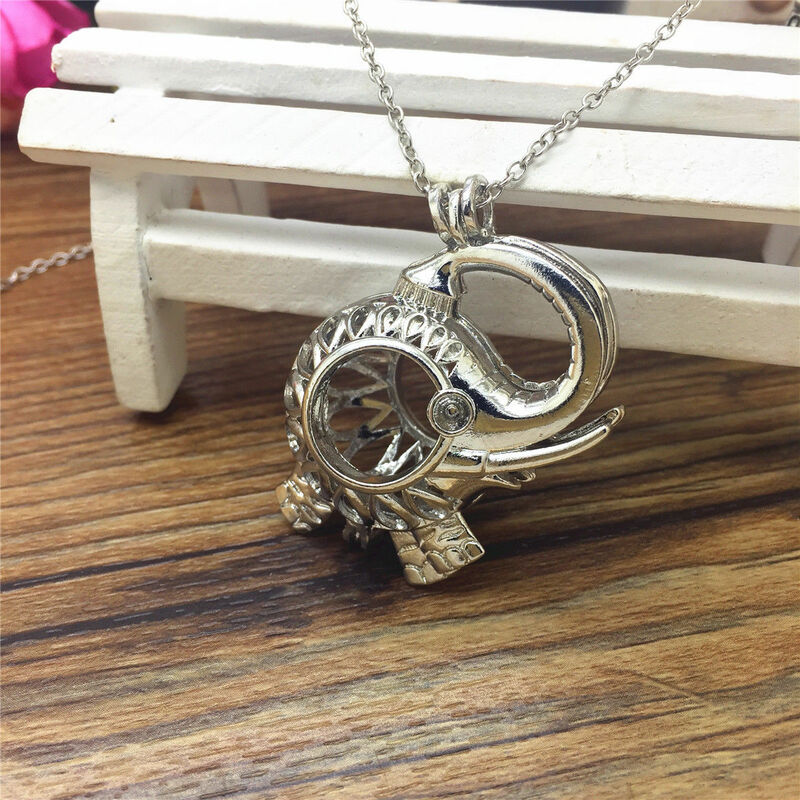 This elephant locket is 1 inch wide and the chain is 18 inches long. It has 2 diffuser ball pads for the essential oils (Essential oils not included). Just put a drop or two on the pad and put in locket. The pad will last several hours. Then reuse by repeating instructions. Stylish and practical! 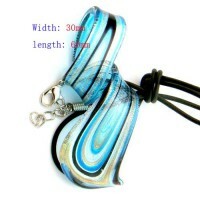 Hand blown murano glass pendant with 18 " with 2 " extender black ribbon/cord/ necklace. 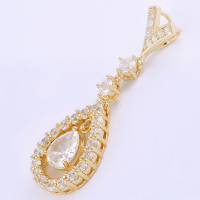 This goldtone Betsey Johnson teardrop pendant is 2 inches long. The gold chain is 28 inches long. You will love it! 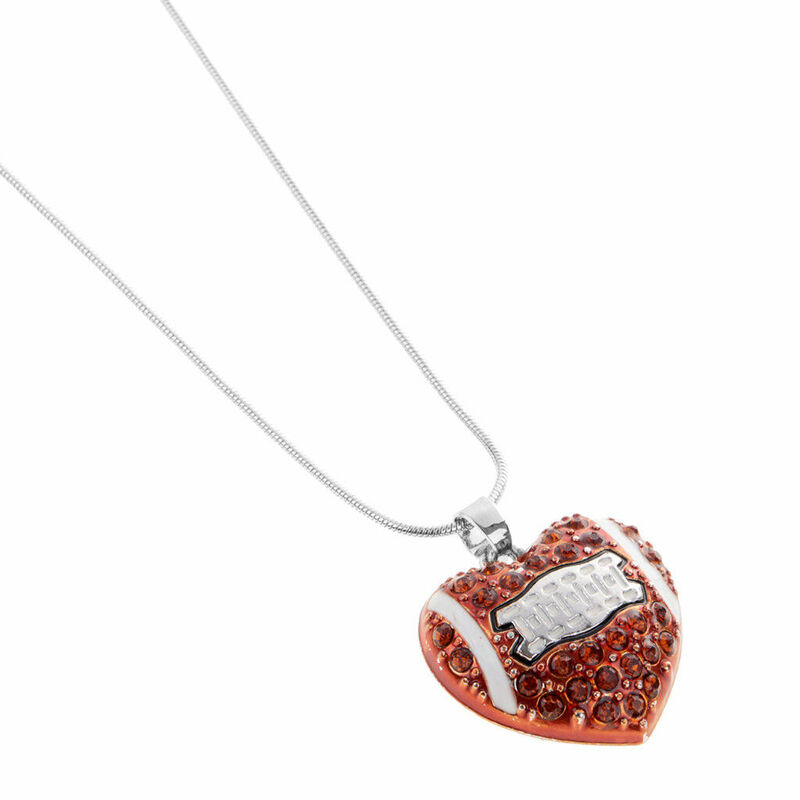 The football heart pendant is 3/4inches" x 3/4 inches made with brown rhinestones. The silver chain is 17 - 19 inches. Great for the avid football fan! This puffy owl locket is 2 inches long and the chain is 20 inches long. It has 2 diffuser ball pads for the essential oils (Essential oils not included). Just put a drop or two on the pad and put in locket. The pad will last several hours. Then reuse by repeating instructions. Stylish and practical! 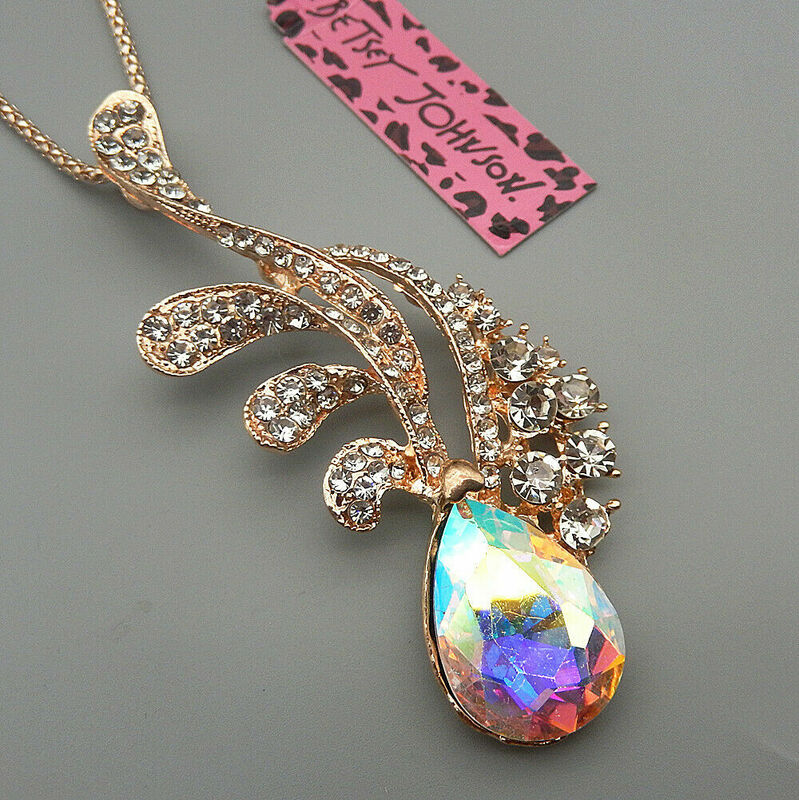 Vintage style fan necklace is made from crystal, resin and alloy metal. It is adjustable from 19 inch - 21-1/2 inches. 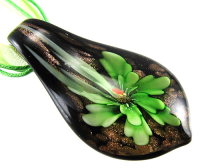 Gorgeous hand blown murano glass black/gold pendant with green flower inside. 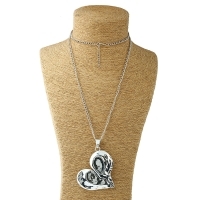 Comes with 18 " green ribbon/ cord necklace with 2 " silver extender. Tassel bib style statement teardropy necklace has clear, black and green beads. The necklace is 18 inches long. Stunning! 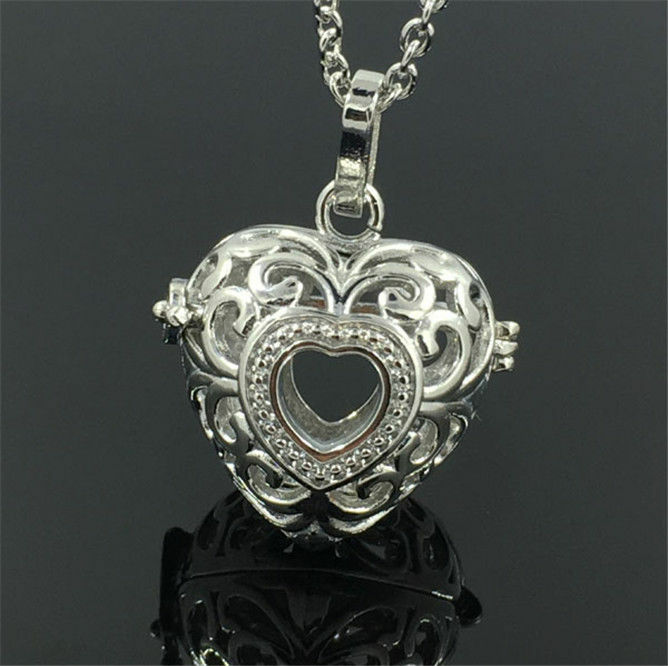 This heart locket is 1 inch long and the chain is 18 inches long. It has 5 diffuser heart pads for the essential oils (Essential oils not included). Just put a drop or two on the pad and put in locket. The pad will last several hours. Then reuse by repeating instructions. Stylish and practical! High Heel Pendant about 1 inch long. Comes with 20 inch silverplated cobra link chain. 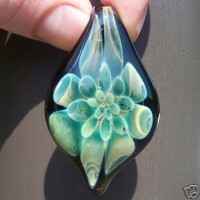 Gorgeous green flower bloom hand blown glass pendant made from boro glass. Pendant is 1-3/4" long x 1-1/8 " wide. Comes with 18 " black cord necklace with silver adjustable 2 " extender. 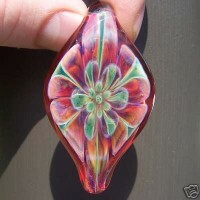 Gorgeous red night flower bloom hand blown glass pendant made from boro glass. Purple in picture shows up more blue in pendant. Pendant is 1-3/4 " long x 1-1/8 " wide. Comes with 18 " black cord necklace with silver adjustable 2 " extender. Gorgeous hand blown glass pendant made from boro glass. Pendant is 1" long x 1" wide. Comes with 18 " black cord necklace with silver adjustable 2 " extender. Gorgeous royal blue with yellow swirl hand blown glass pendant made from boro glass. Pendant is 2 " long x 1" wide. Comes with 18 " black cord necklace with silver adjustable 2 " extender. 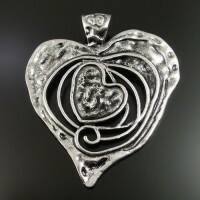 Beautiful silver hammered heart pendant is 2-3/4 inches long x 2-1/2 inches wide. The chain is 37-1/2 inches. Gorrgeous accent piece! 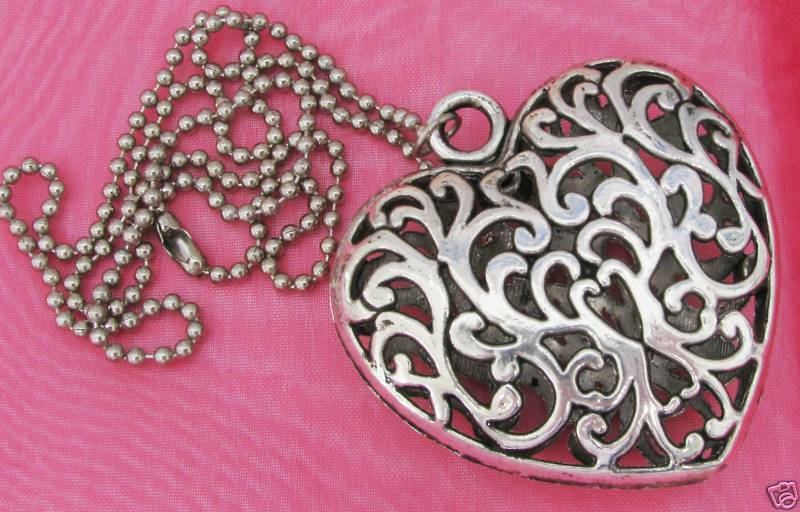 Vintage style puffy heart pendant is 2" x 2" on a 24 inch chain. Pretty! 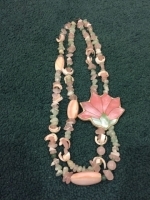 This beautiful Lee Sands unsigned necklace was made in Hawaii in the 1980's. This handcrafted Flower Necklace is 25 1/2" length Sterling Silver bead and findings stamped .925 clasp. Beads used are Rose Quartz/Pink and Teal Cultured Freshwater Pearl Nuggets/Swarovski Crystal golf beads AB. The Pendant size: 2 3/4"l x 3"h. Stunning! 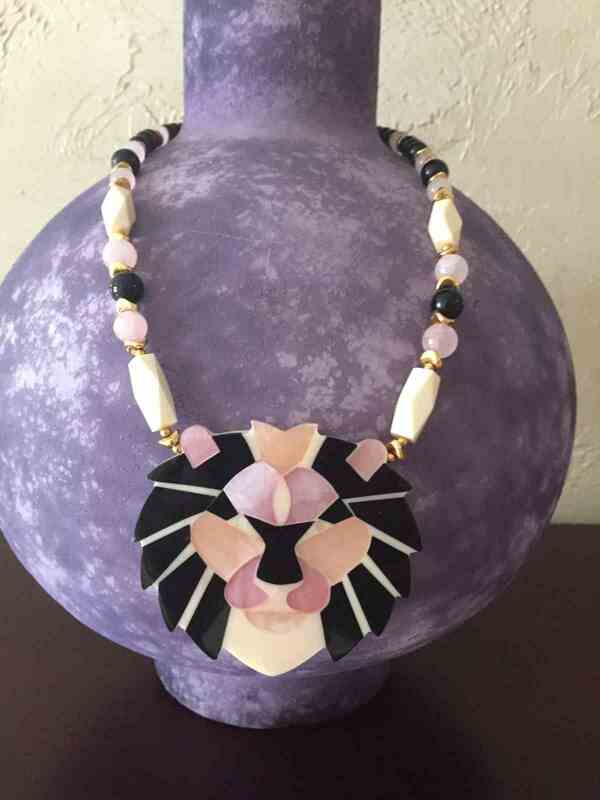 Vintage 1970's Lee Sands pendant is inlaid with black shell, white and pink mother of pearl. 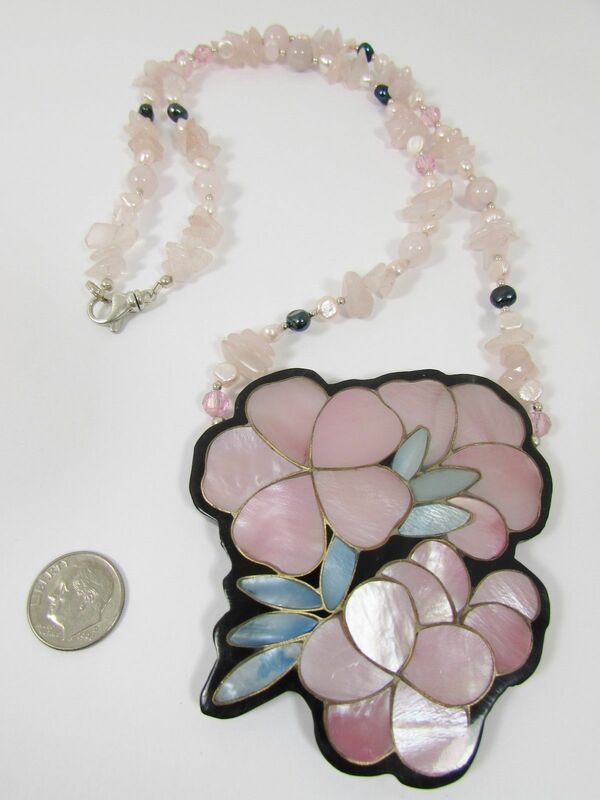 Necklace made with black, rose quartz and mother of pearl beads measures 25" in length. Lion pendant measures 3" in length. Stunning! This vintage necklace is from the 1980's. The double strand is made from aventurine, pink quartz and shell beads. It is 23 inches long. The pendant is shades of mother of pearl and is 2 5/8” (L) by 2 ½” (H) by ¼” (W). Breathtaking! 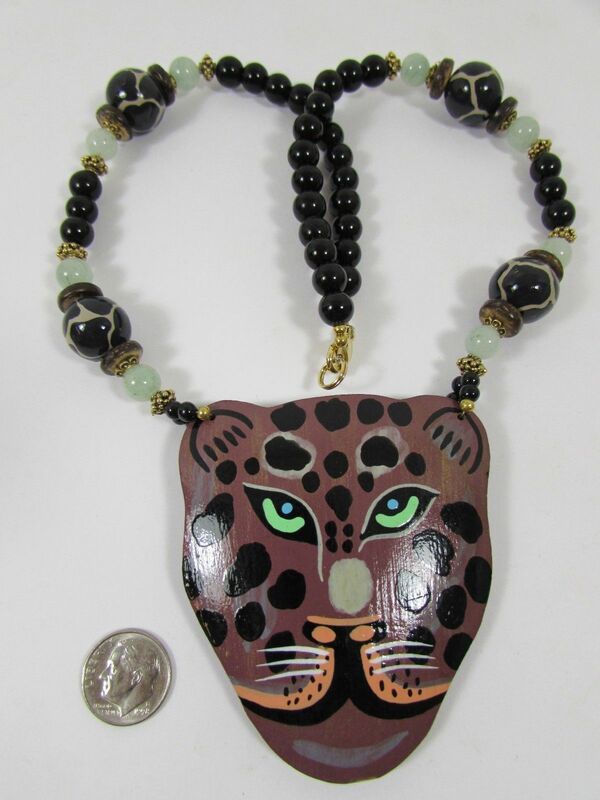 This vintage1980's, 21inch Hand Painted Leopard Face Wooden Motif Necklace is strung with Aventurine, Coconut, Black Shiny Glass, painted animal print wooden beads, accented with antiqued gold (pewter based) beads. It ws made in the 1980's. Comes with a Lee Sands gift box. Leopardite semi-precious stone and alpaca silver necklace. It is made with alpaca silver, which is an alloy of zinc, copper, iron and nickel. It is extremely lightweight and will not rust or tarnish. The necklace was handmade in Peru. 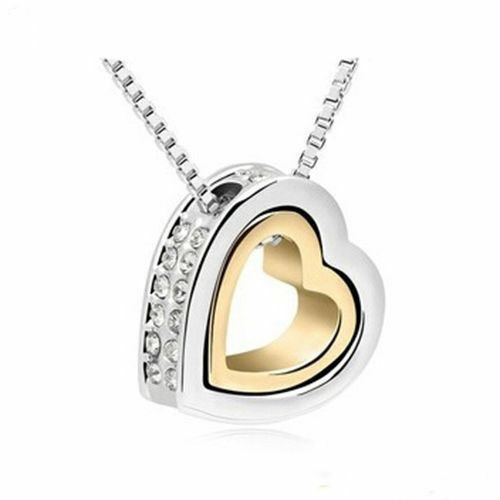 Gorgeous engraved gold love surrounded by a heart of rhinestones. Necklace is 29 inches adjustable. Pendant is 1-1/2 inches long. White Enamel high heel shoe with mutli colored rhinestones (pearl strand not included.). Pendant is 1-5/8 inches tall x 1-3/8's inches wide. Comes with a 20 inch fine silvertone chain. Delicate sterling silver 1 inch musical note pendant has amethyst and rhinestone crystals. Comes with 20 inch sterling silver snake chain (not the chain pictured.). 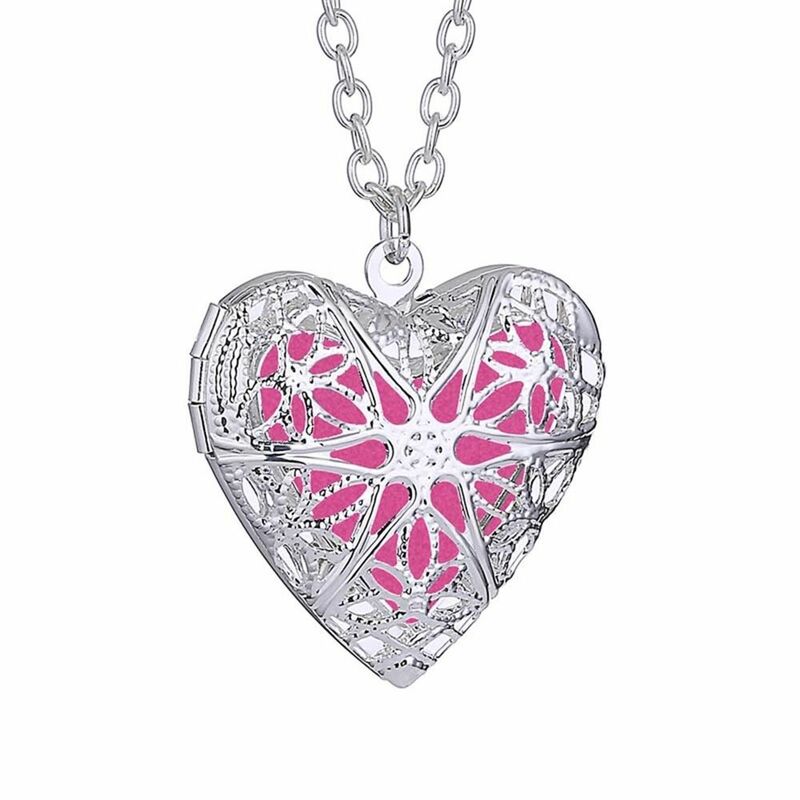 This puffy heart locket is 1 inch long and the chain is 18 inches long. It has 2 diffuser ball pads for the essential oils (Essential oils not included). Just put a drop or two on the pad and put in locket. The pad will last several hours. Then reuse by repeating instructions. Stylish and practical! 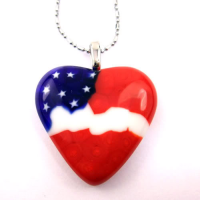 Red, White and Blue hand blown glass 1-1/4 inch pendant. Navy ribbon and cord 17 - 19 inch necklace. 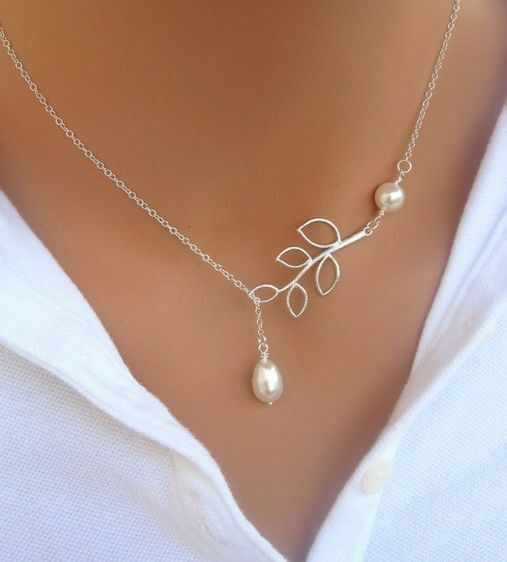 This gorgeous necklace has an open silver leaf with a faux pearl drop. It is 18 inches long. Very pretty! 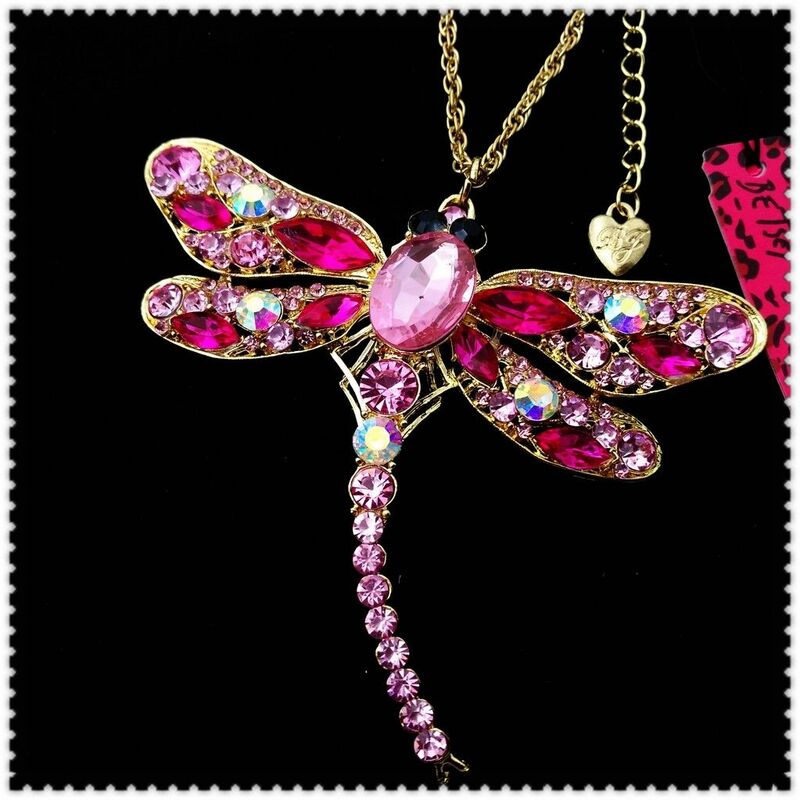 Gorgeous goldtone 2 inch butterfly pendant is made with pink and black rhinestones on the wings and clear crystals for the body.. The chain is 20 inches. This combination is beautiful and will enhance any outfit! 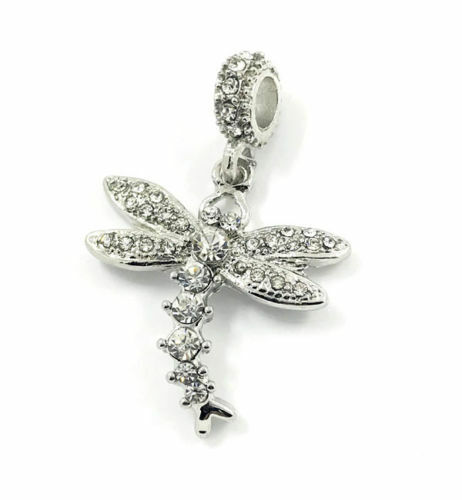 This gold plated Betsey Johnson dragonfly pendant is made with 2 shades of pink rhinestones. The gold chain is 27-1/2 inches long. The pendant is 2-5/8 inches x 3-1/4 inches. Stunning! Gorgeous hand blown glass black pendant with pink flower inside. Comes with 18 " pink ribbon/cord necklace with 2 " silver extender. This gold plated Betsey Johnson lipstick pendant is made with pink and clear rhinestones. The snake chain is 26 inches long. The pendant is 1-1/4 inches x 1 inches. Perfect for advertising your makeup business or just for fun! This goldtone Betsey Johnson pink stilleto shoe has clear rhinestones. The gold chain is 28 inches long. Also available in black as well as teal. A woman can never have too many shoes! This silvertone princess cut blue crystal rhinestone pendant is surrounded by clear rhinestones. It is 1/2 inch x 1/2 inch square. The fine chain is 18 inches long. Very pretty! 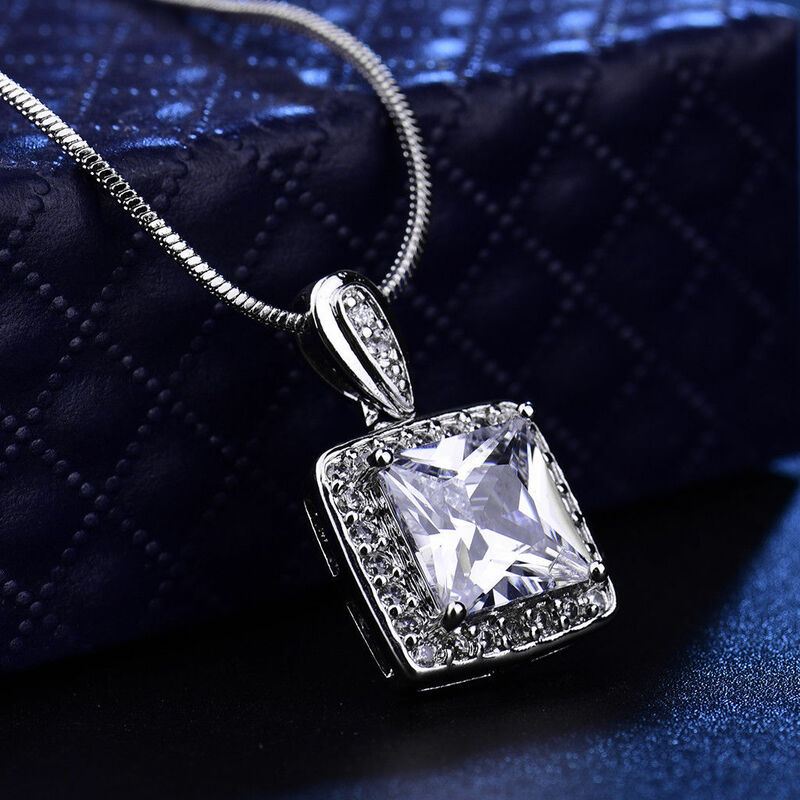 This silvertone princess cut clear crystal rhinestone pendant is surrounded by clear rhinestones. It is 1/2 inch x 1/2 inch square. The fine chain is 18 inches long. Very pretty! 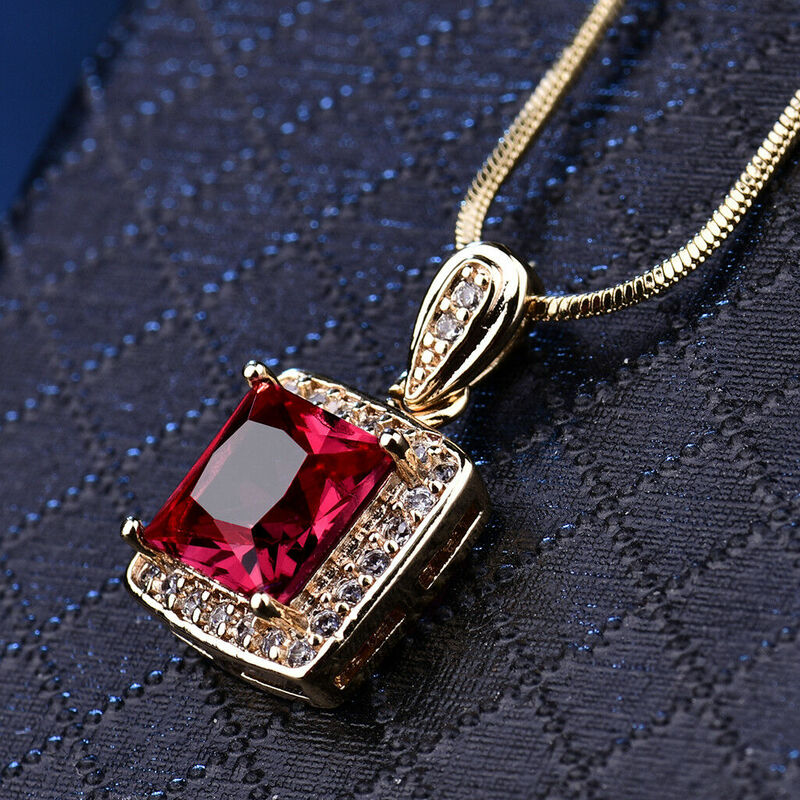 This goldtone princess cut ruby crystal rhinestone pendant is surrounded by clear rhinestones. It is 1/2 inch x 1/2 inch square. The fine chain is 18 inches long. Very pretty! This silvertone princess cut ruby crystal rhinestone pendant is surrounded by clear rhinestones. It is 1/2 inch x 1/2 inch square. The fine chain is 18 inches long. Very pretty! 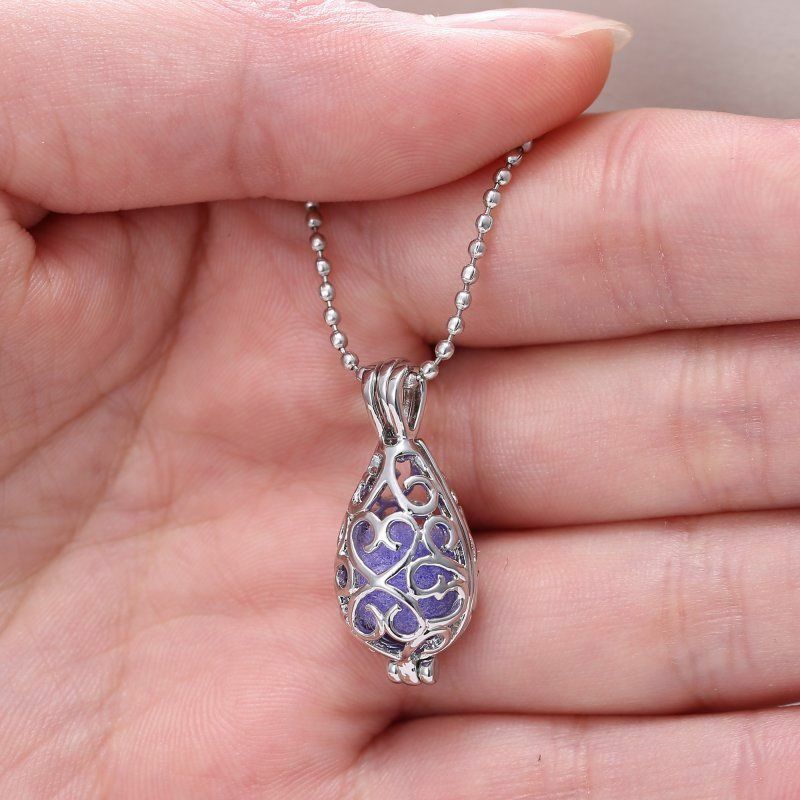 This pretty puffy vintage pendant is 1-1/4 inches long and wide. The chain measures 32 inches. Stunning accent piece! 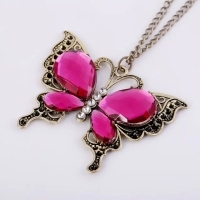 The Betsey Johnson butterfly pendant is gold plated withpurple rhinestones. 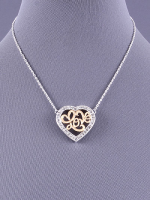 The pendant is 2-3/8 in x 1-1/2 in. The gold chain is 28 inches. Stunning! 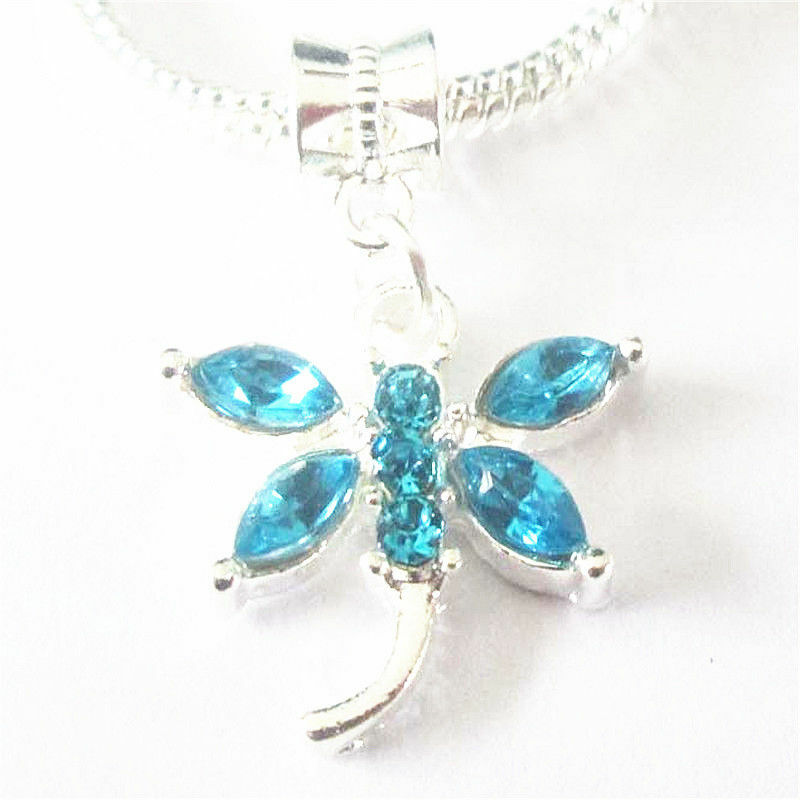 This dainty dragonfly is made with purpl,,teal and clear rhinestones. The chain is 17 - 20 inches adjustable. The pendant is 3/4 in x 1 in. Gorgeous! 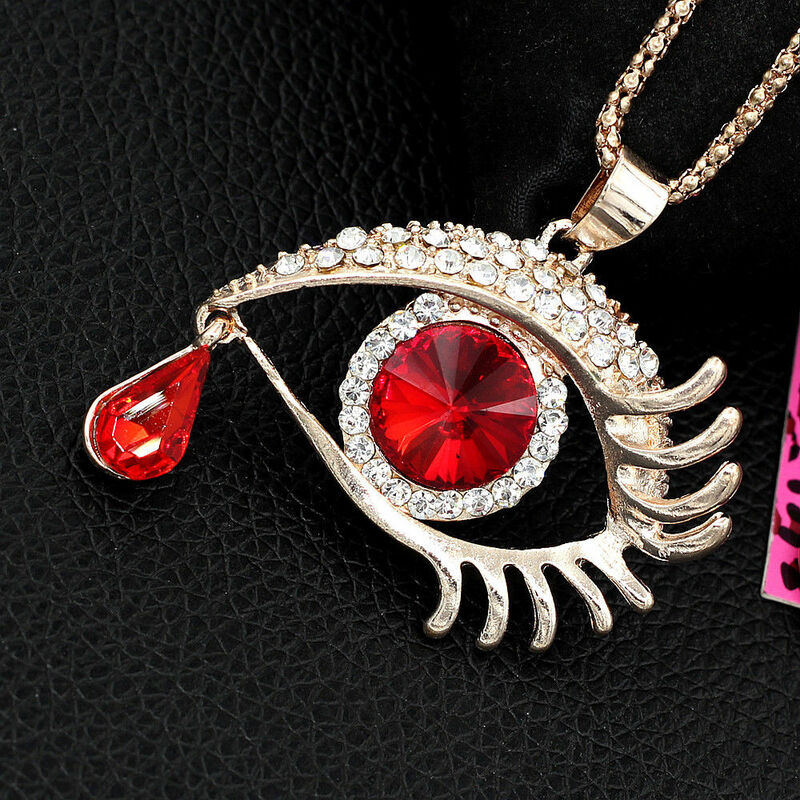 This gold plated Betsey Johnson eye pendant is made with red and clear rhinestones. The chain is 27-1/2 inches long. The pendant is 2 inches x 1-5/8 inches. Perfect for someone in the makeup industry to advertise their business or for just fun! 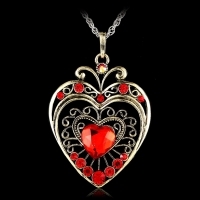 This retro style red heart pendant has an antique gold finish and is 3 in x 2 in. It comes with a snake chain that is 26 inches long. Very elegant! 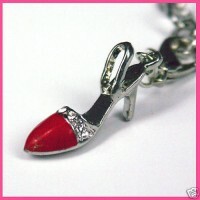 Beautiful Betsey Johnson red rhinestone lips with single clear rhinestone pendant is 2 inches x 1 inch. The gold chain is 27 inches long. Great for fun or for promoting your beauty products! 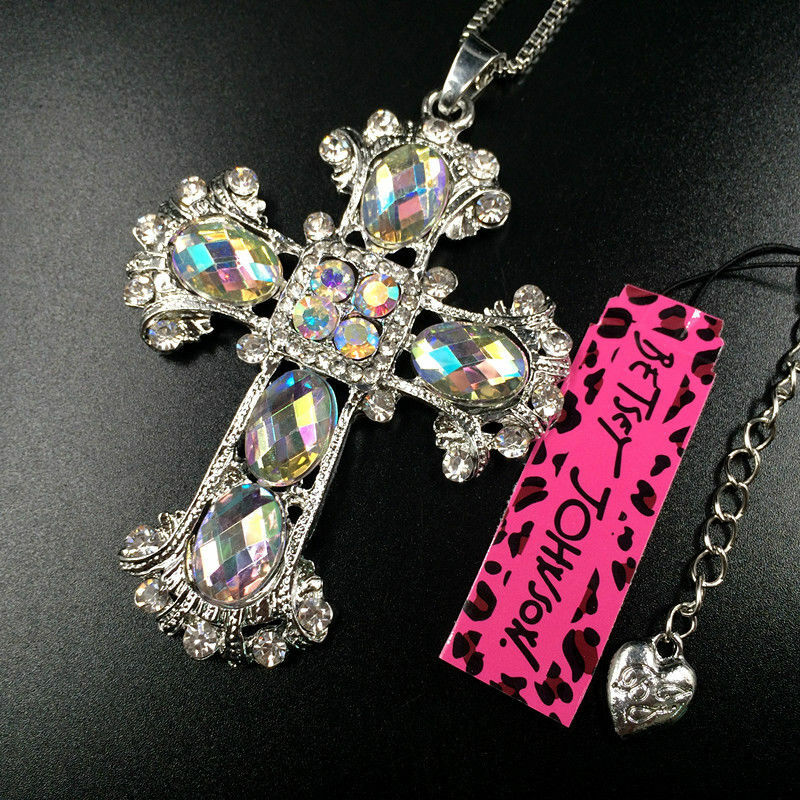 This silver plated Betsey Johnson cross pendant is made with clear ab rhinestones. The chain is 28 inches long. 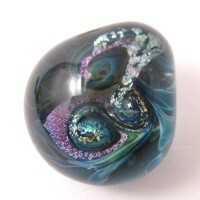 The pendant is 2-1/4 inches x 3-1/4 inches.Stunning! 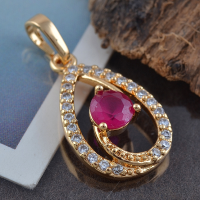 Dazzling White & Ruby Gems 14K Gold Filled stunning pendant is 1 inch long. Comes with a delicate 20 inch gold plated chain. Silvertone bali style cross is 1 - 1/3 inches high x 3/4 inches wide. Comes with 18 inch ball chain. 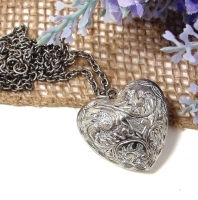 Vintage 1 inch x 1 inch filigree puffy (both sides) heart. 24 inch chain. 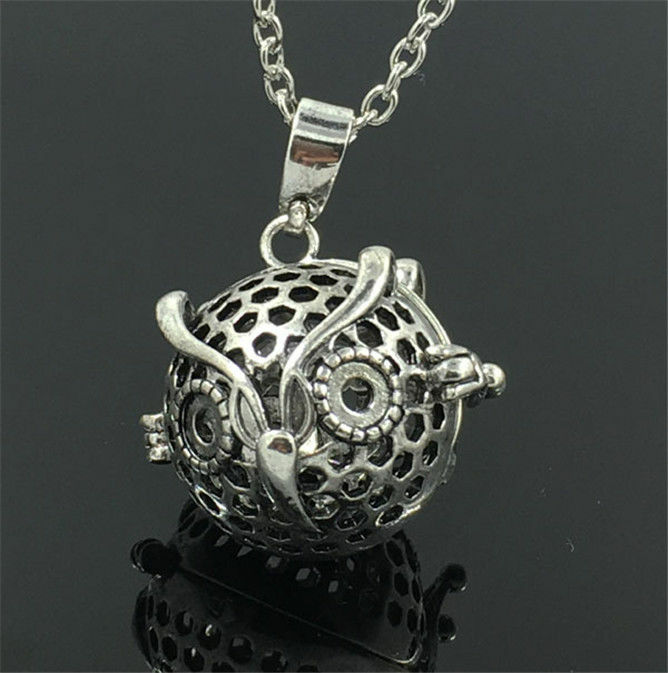 This puffy starfish locket is 1 inch long and the chain is 18 inches long. It has 2 diffuser ball pads for the essential oils (Essential oils not included). Just put a drop or two on the pad and put in locket. The pad will last several hours. Then reuse by repeating instructions. Stylish and practical! 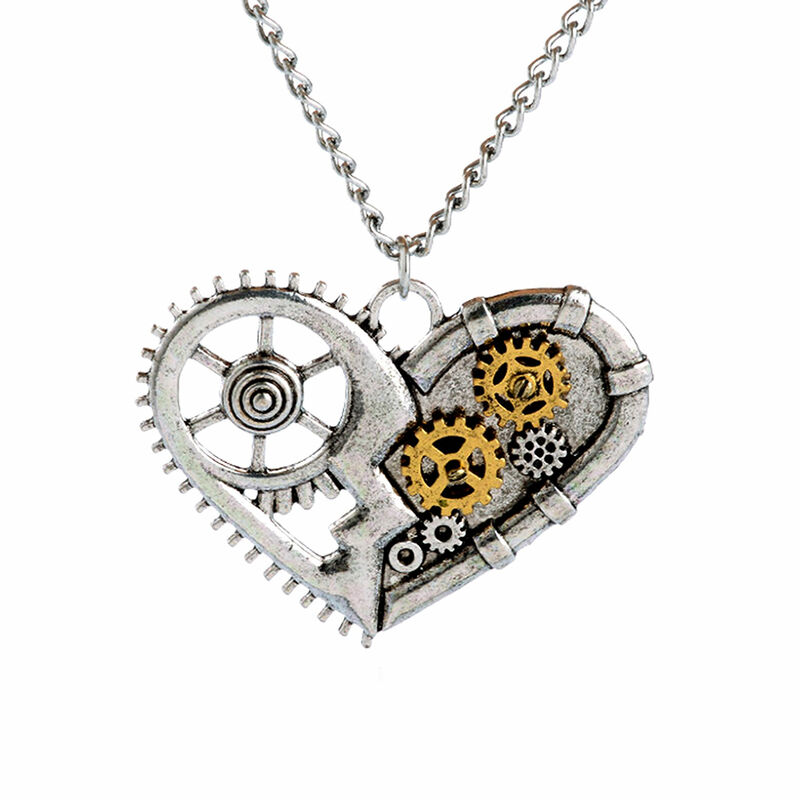 This steampunk gear heart pendant is 2 inches x 2 inches. The snake chain is 28 inches long. Goes with silver and gold! Very versatile! 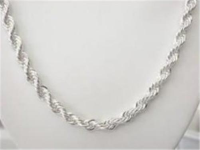 This beautiful sterling silver rope chain is 4 cm wide and 22 inches long. It is a versatile classic piece that can be used as a chain with a pendant (not included) or alone. This teal rhinestone dragonfly is 1 inch long. The chain is 20 inches long. Lovely! 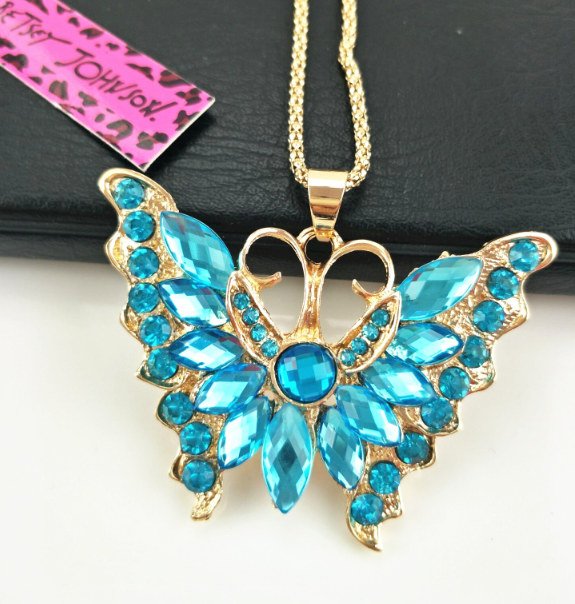 The Betsey Johnson butterfly pendant is gold plated with teal rhinestones. 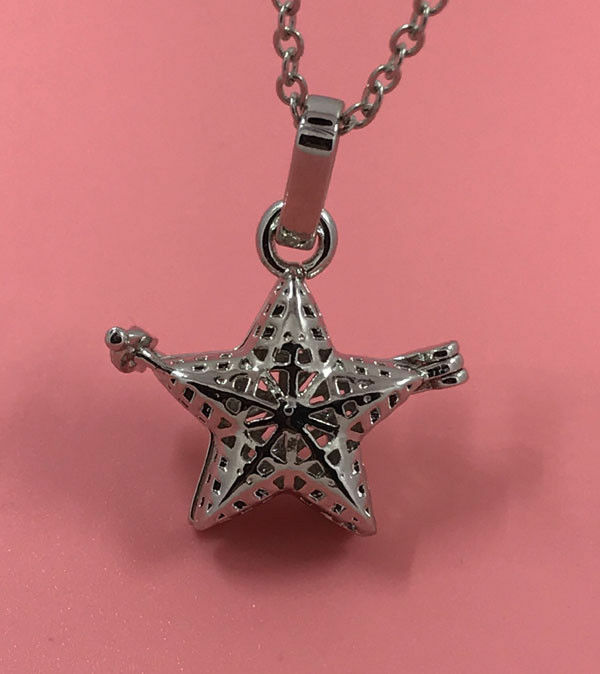 The pendant is 2-3/8 in x 1-1/2 in. The gold chain is 28 inches. Stunning! 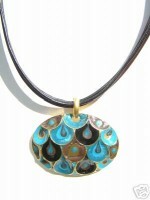 Beautiufl teal enameled pendant with 18 " adjustable black cord necklace. This teardrop pendant is 1 inch long and the snake chain is 20 inches long. It has 3 diffuser ball pads for the essential oils (Essential oils not included). Just put a drop or two on the pad and put in locket. The pad will last several hours. Then reuse by repeating instructions. Stylish and practical! 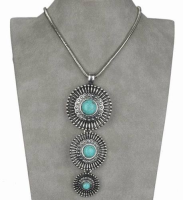 This faux turquoise, triple flower pendant is 4 inches long and hangs on a 18-20 inch snake chain. Eye catching! 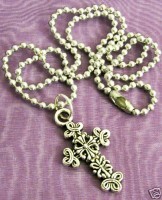 Unisex silvertone large cross is 2- 1/4 inches high x 1- 1/4 inches wide. Comes with 24 inch ball necklace chain. This beautiful retro 1980's unsigned Lee Sands 20 inch necklace alternates wooden beads, mother-of-pearl beads, and heishi shells for au naturel appeal. 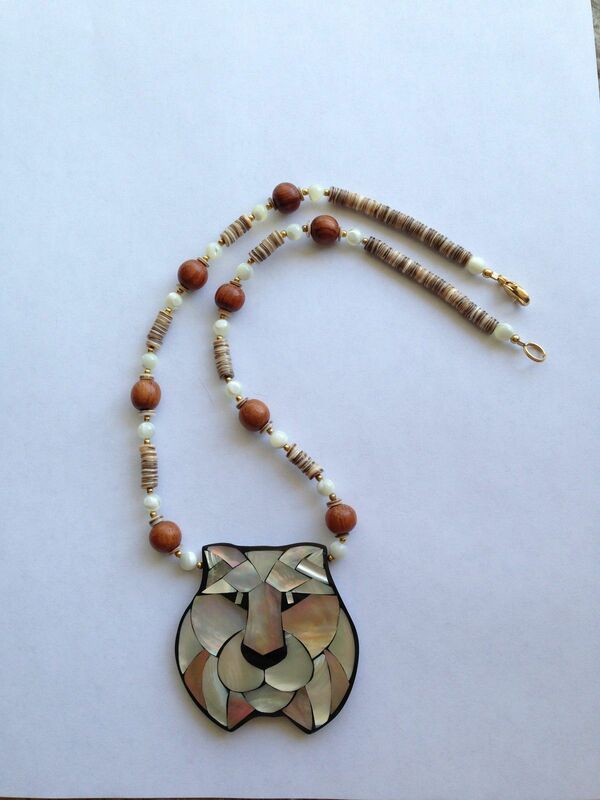 A bold lioness pendant, inlaid with mother of pearl and abalone, roars at the center. Pendant is 2-1/8"L x 2-1/8"W. Made in Hawaii, a truly beautiful gift that will be treasured for years to come! This stunning vintage necklace from the 1980's has mother of pearl and paula shell inlaid in the Calla Lily pendant. The necklace is 19 1/8" length with 2" extender. Clasp is stamped LS. Pendant size is 2 1/4"x 2 3/4"x thickness which is over 1/8" back of pendant stamped Lee Sands. 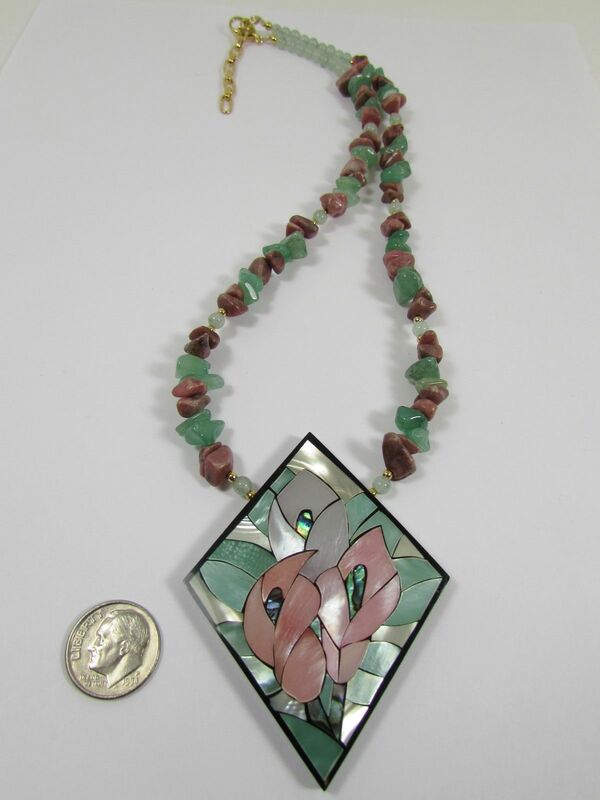 Necklace strung are rhodonite and aventurine chips. Comes in a Lee Sands gift box. 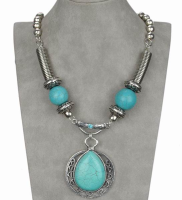 Vintage style, faux turquoise round pendant is antique silver plated and is 1- 1/2 inches long. The chain is 22 inches with a 2 inch extender. .
Goldtone filigree woven wire work 30 inch necklace. Enhances any outfit! Vintage 1970's glass white faux pearl with crystal beads and gold plated findings. Necklace is 16 inch with 2 inch gold extender. Stylish White Oval Topaz Gemstones surrounded by 14k Real Rose Gold Filled Pendant is 1-5/8's inches long and 1/2 inch wide. Comes with a 20 inch gold plated delicate chain. 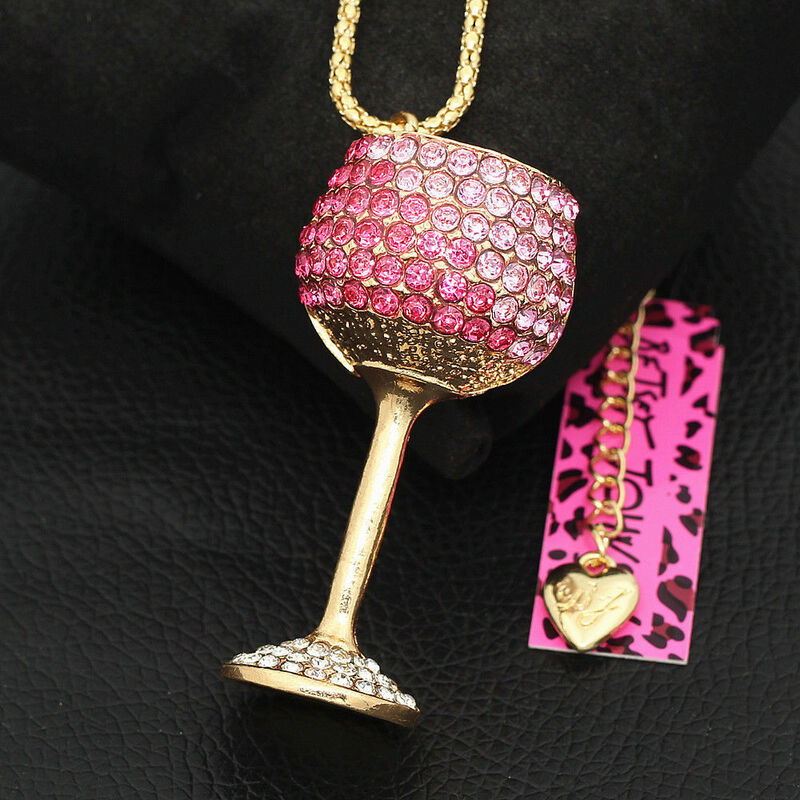 This gold plated Betsey Johnson wine pendant is made with 2 shades of pink and clear rhinestones. The chain is 27-1/2 inches long. The pendant is 2-1/8 inches tall x 1-1/4 inches wide. Perfect for someone in the wine industry to promote their business or for just fun!